1. In a pressure cooker, heat some oil and add the whole spices (bay leaf, cardamom & cinnamon) along with the haldi powder. When the bay leaf starts changing its color, add the green chillies and the ginger garlic paste and saute for a few seconds. Then add the chopped onions. 2. Once the onions turn translucent, add the peas, badiyan and rest of the spices. Let it cook for a few minutes and then add rice and 4 cups of water. Mix well, put the cooker lid on and let it cook on medium heat. 3. After 3 whistles, turn off the gas and let the cooker sit for a while till the pressure subsides. 4. Garnish it with fresh coriander while serving. 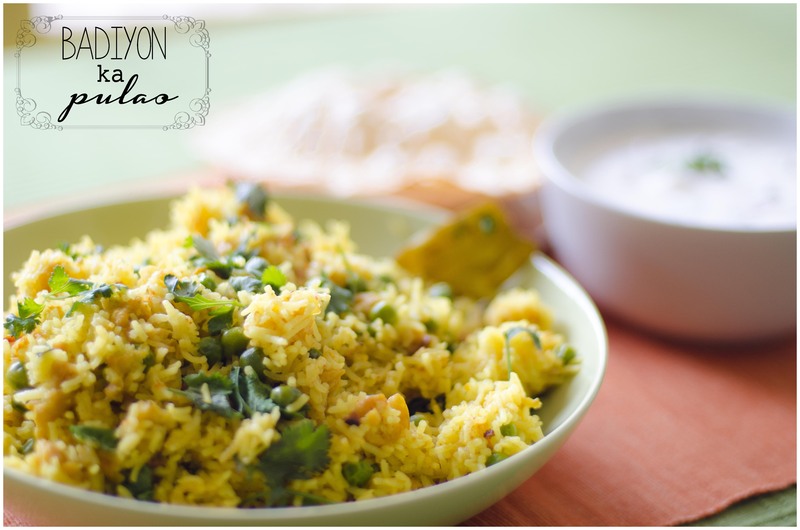 Serve it with raita, mint chutney and papad (Lijjat papad; easily available at all indian stores). This entry was posted in FOOD, Recipes and tagged Basmati, Bay leaf, Cinnamon, indian food, pulao, recipes, Rice. Bookmark the permalink. Mumma, they were already semi fried. Well done – am sure it must have tasted delicious – looks good too !